According to the InVisage Technologies the quantum dots themselves are twice more sensitive to light than traditional photodiodes and that their placement on the sensor surface offers a further doubling of sensitivity over front-illuminated CMOS designs. The film can be positioned on conventional circuitry, allowing the chips to be produced more cheaply than CMOS or CCD designs. Also bear in mind that producing smaller sensors is cheaper per area unit than producing large sensors so camera using the new sensors should be far cheaper than their rivals. But the best part is, of course the better sensitivity to light, which should theoretically allow a cameraphone-sized sensor (1/2.5″ inches in diagonal in the best case) to give low-light results (ISO performance) similar to what we are currently seeing from entry and mid-range dSLR cameras. Of course this is just in theory as we all know that things don’t work that well in practice. Nor is image quality all about the low-light performance but this has been a traditional weakness of all small sensor cameras. 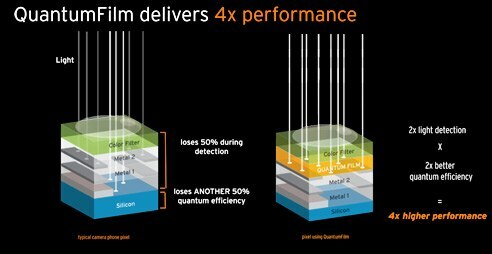 The first QuantumFilm image sensors, targeting high-end mobile handsets and smartphones, will be manufactured in Q4 of 2010, so we should probably be expecting the first devices some time in H1 of 2011.